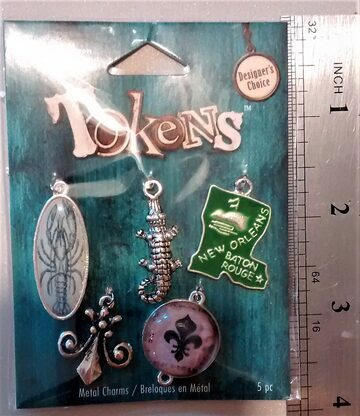 This package contains five metal charms that depict Louisiana. 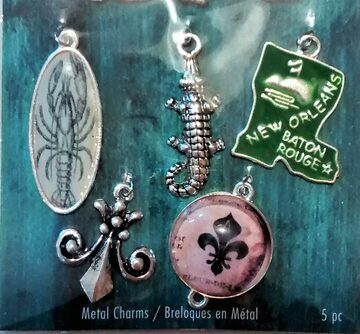 Two of the fleur de lis, one of a lobster, one of an alligator, and a charm of Louisiana State with New Orleans and Baton Rouge on it. 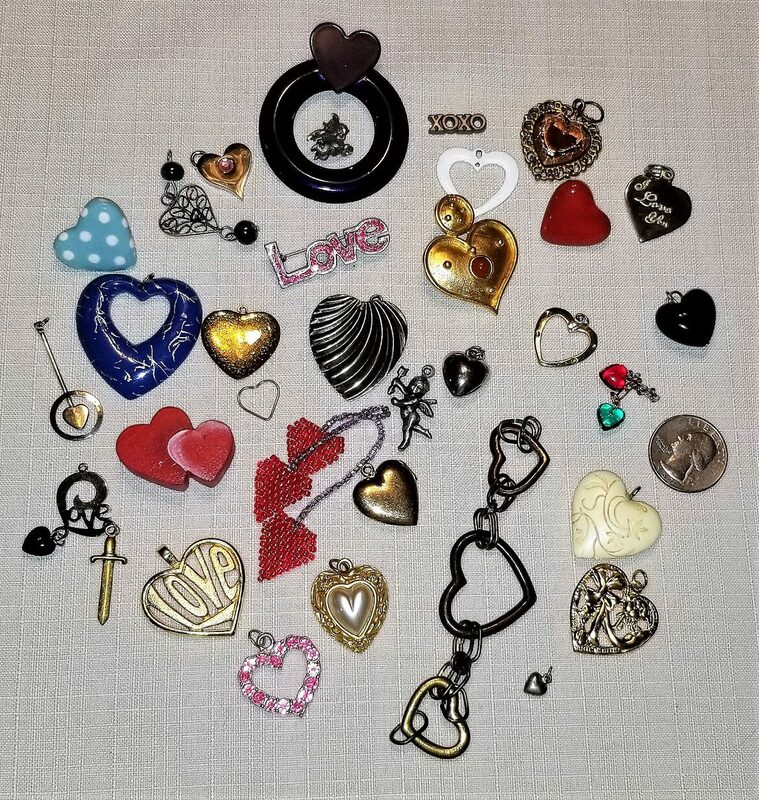 They are nicely made, heavy, and cute and would make a great addition to almost any craft project, or charm bracelet. 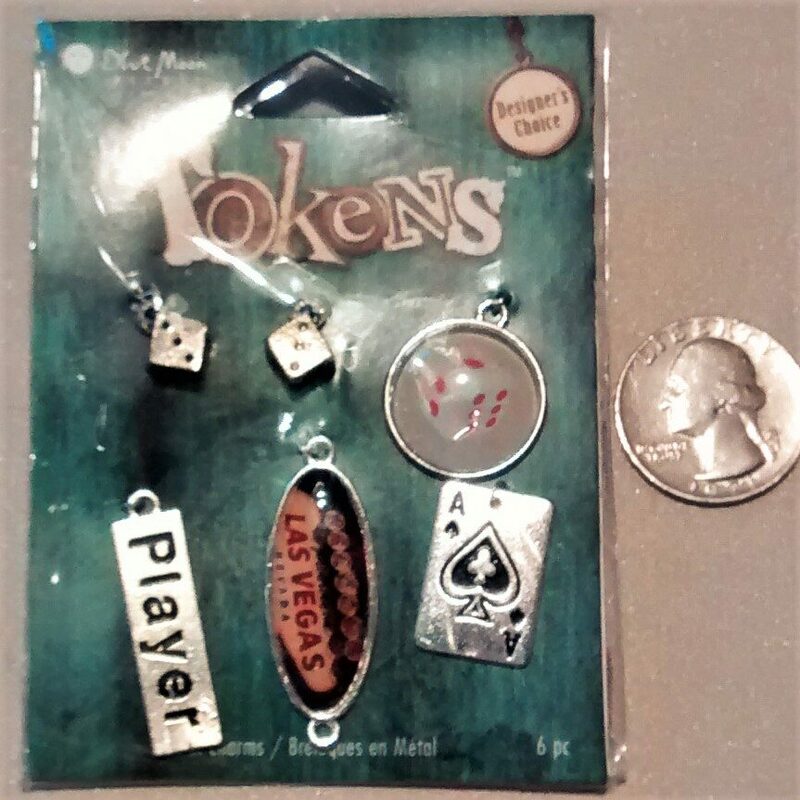 Size varies from 1" to 1 1/2". 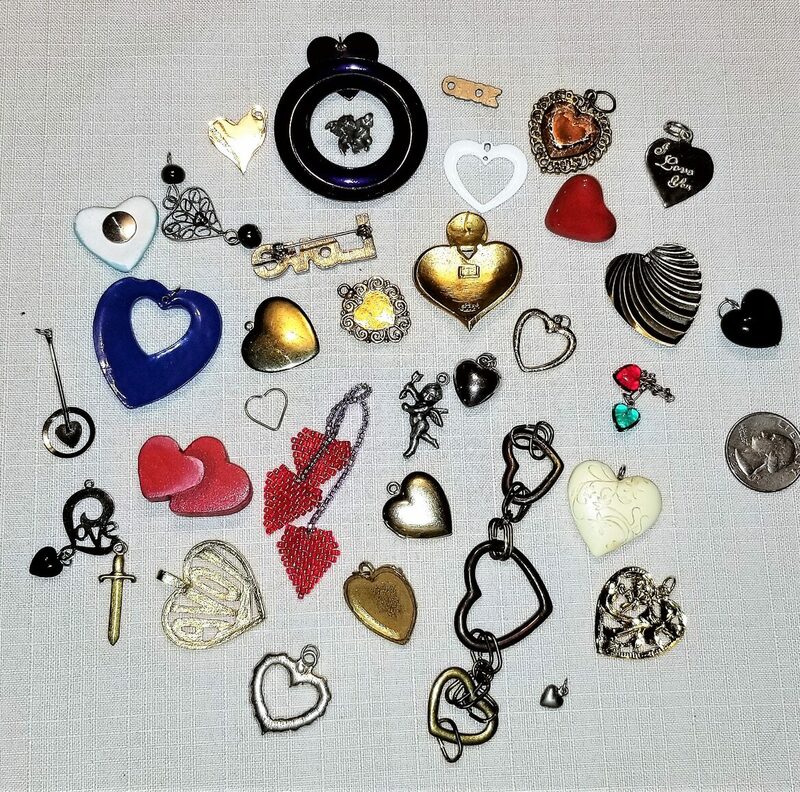 Please check with the pictures to get an idea of size and variety. A lot of possibilities to be had. 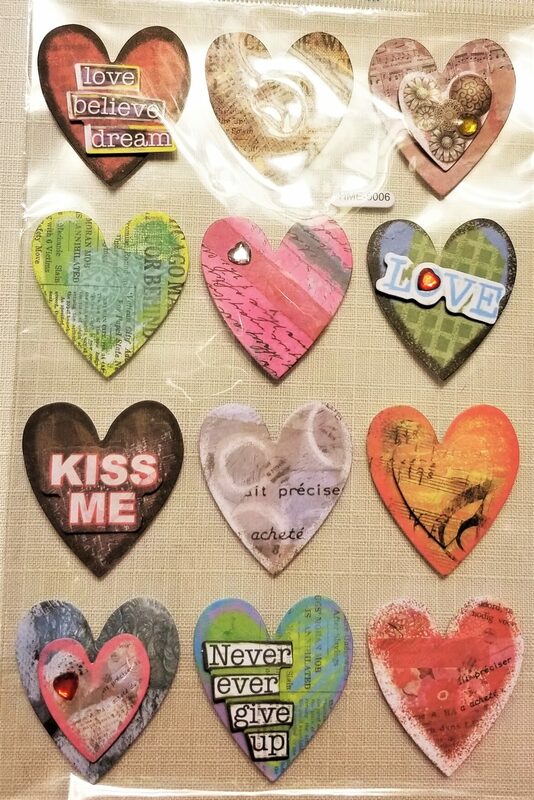 Twelve of the cutest, colorful, heart paper embellishments. 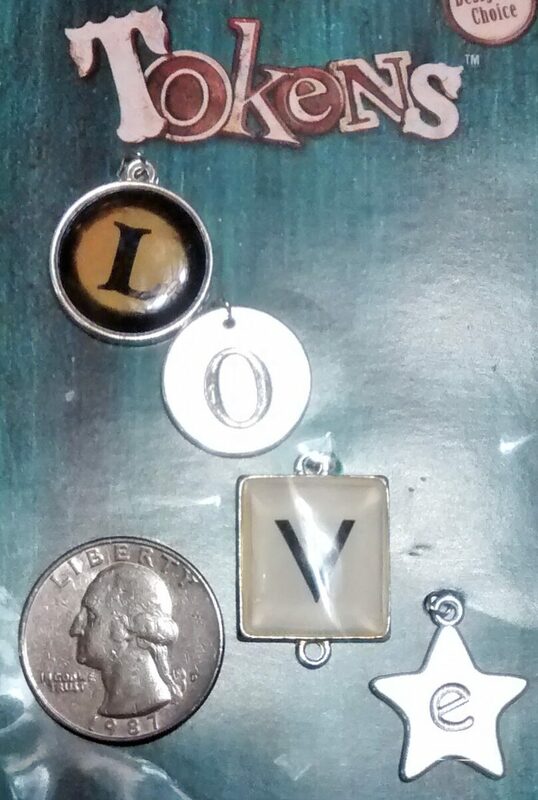 Decorated with shiny cabochons and words. 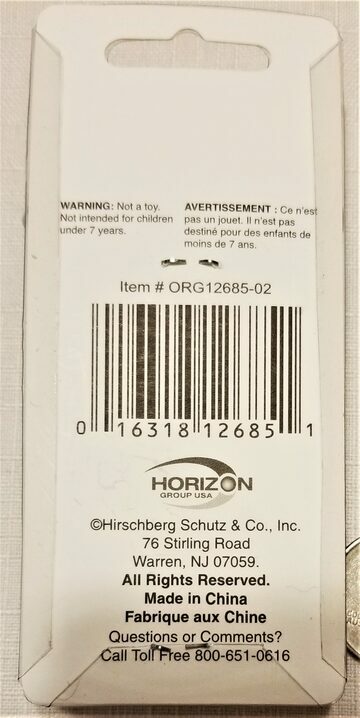 They have 3-D features and come with a sticker on the back for attachment. 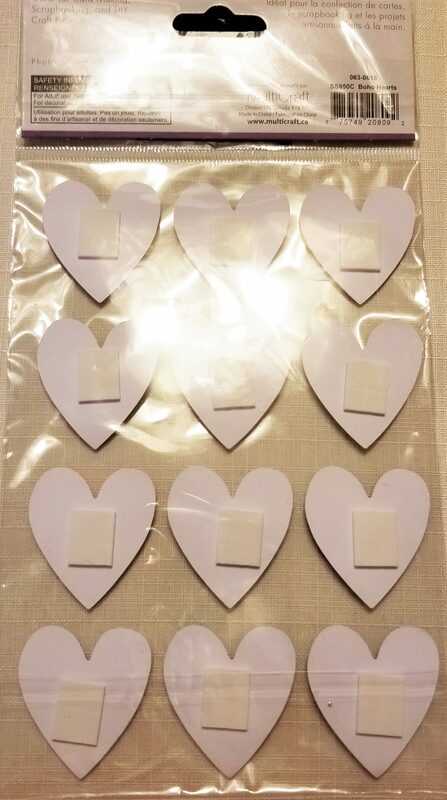 Hearts are approx. 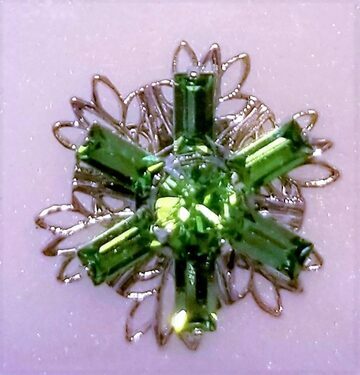 1 1/2" length x 1 1/2" width. 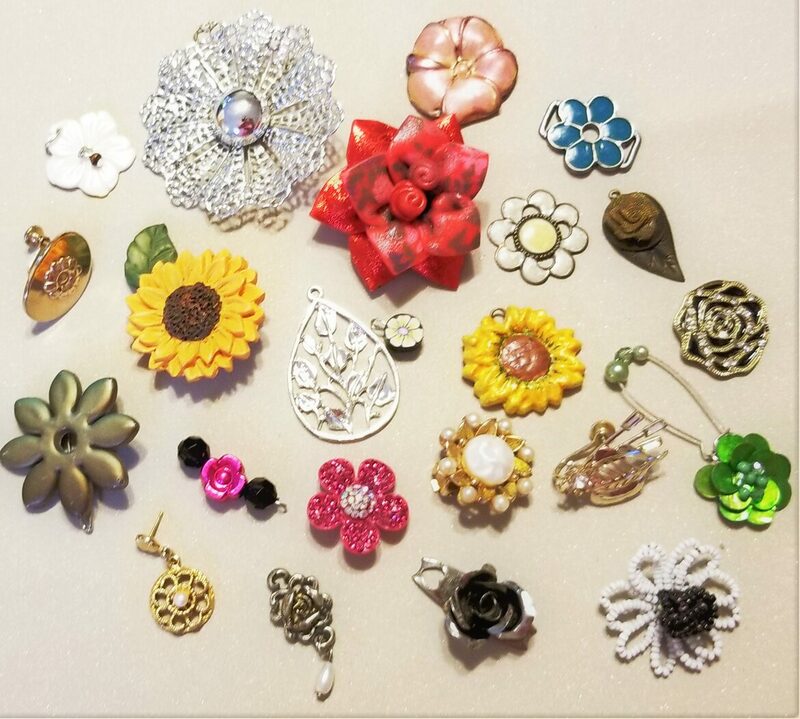 Please check with the pictures to get an idea of size and variety. 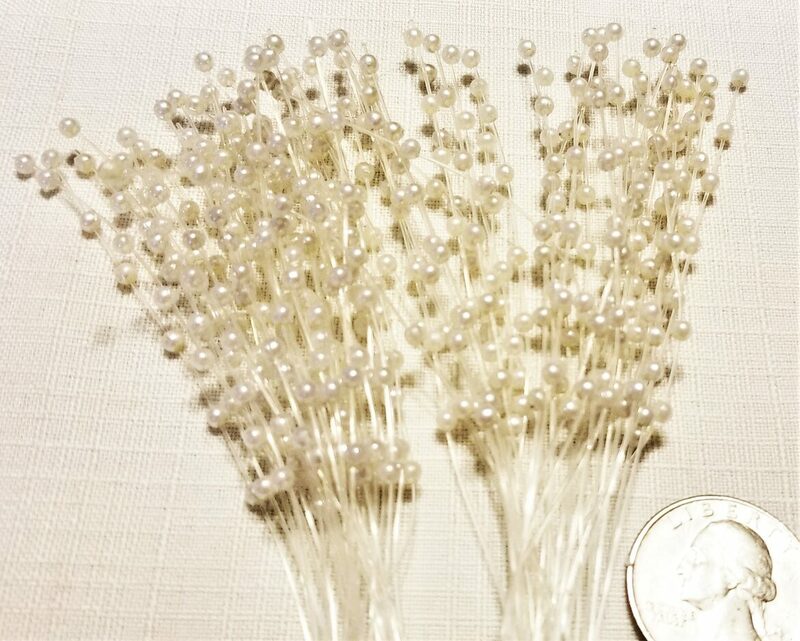 These are pretty, little pearl sprays. 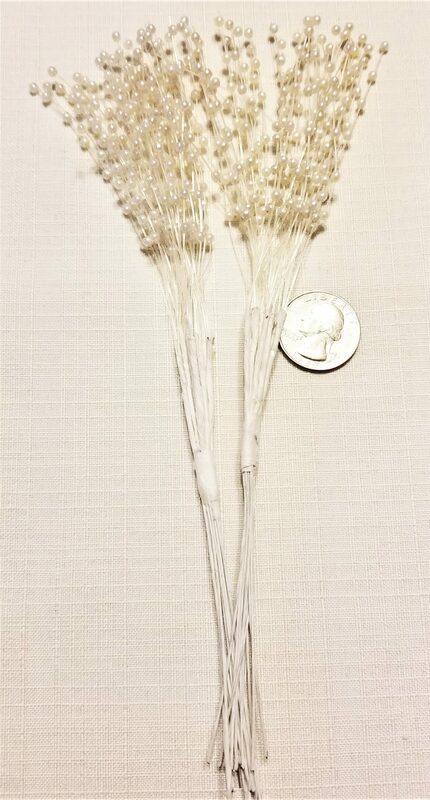 7 inches in length, 3 filaments with attached pearls (18) per stem. 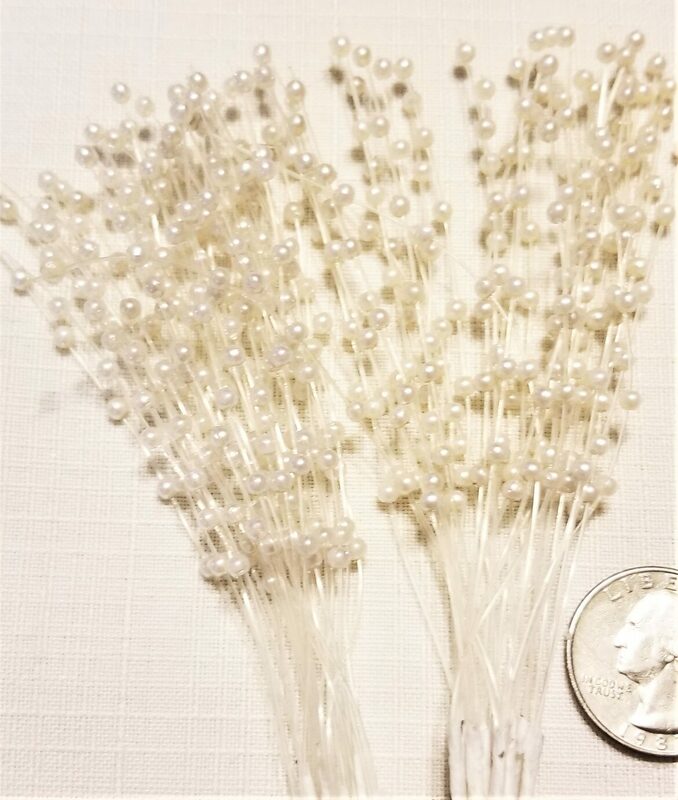 24 stems per package. 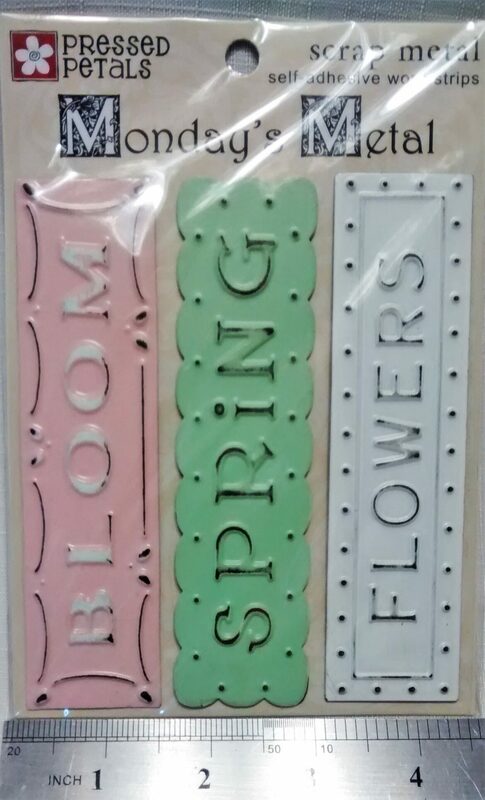 I can see these in all kinds of crafts. Hats, flower arranging, or anywhere. 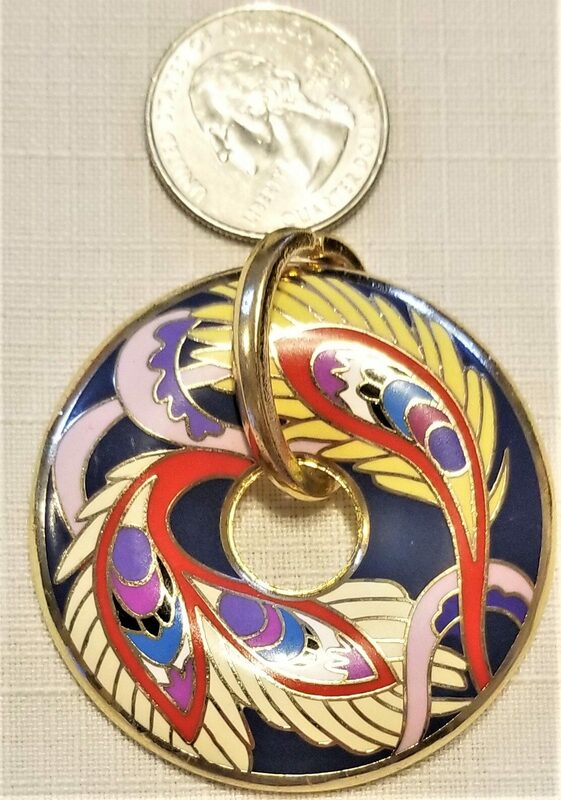 Pretty silver key, approx. 2 3/4" in length. 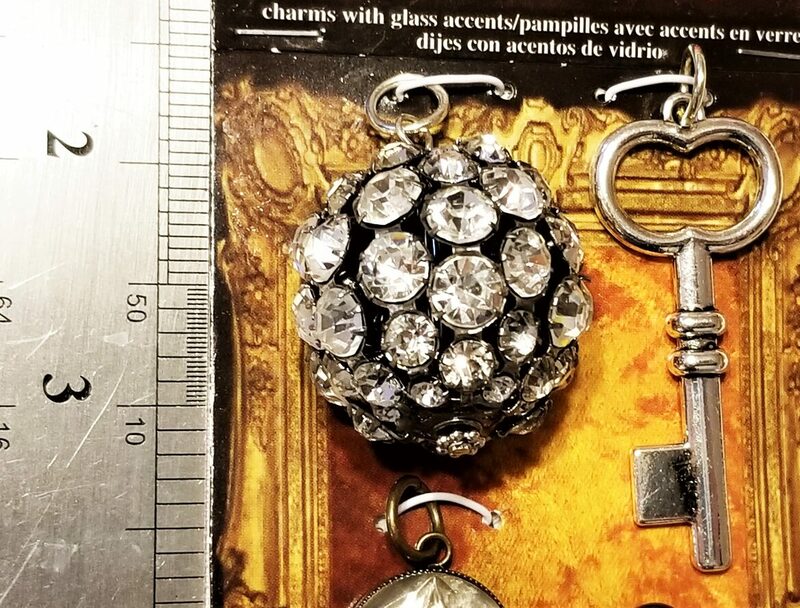 There are rhinestones in the key head. 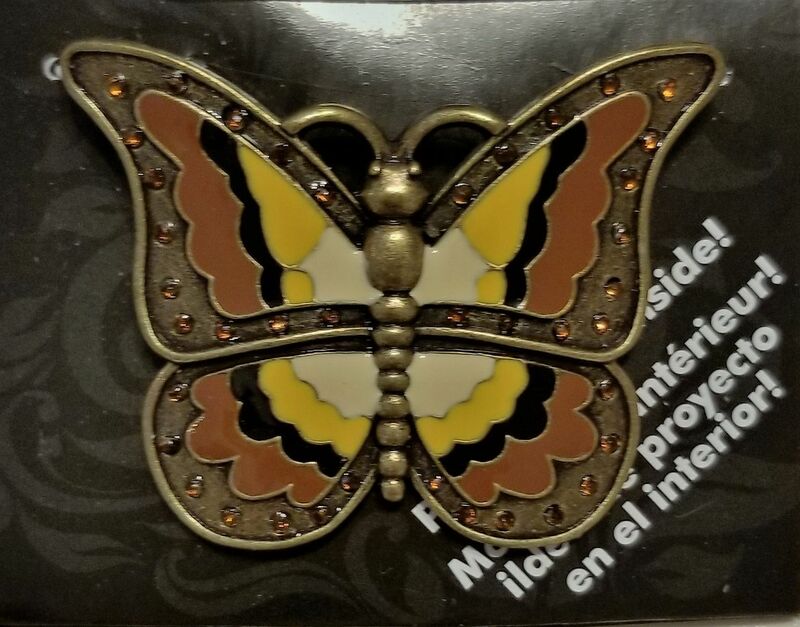 It has a pin back. 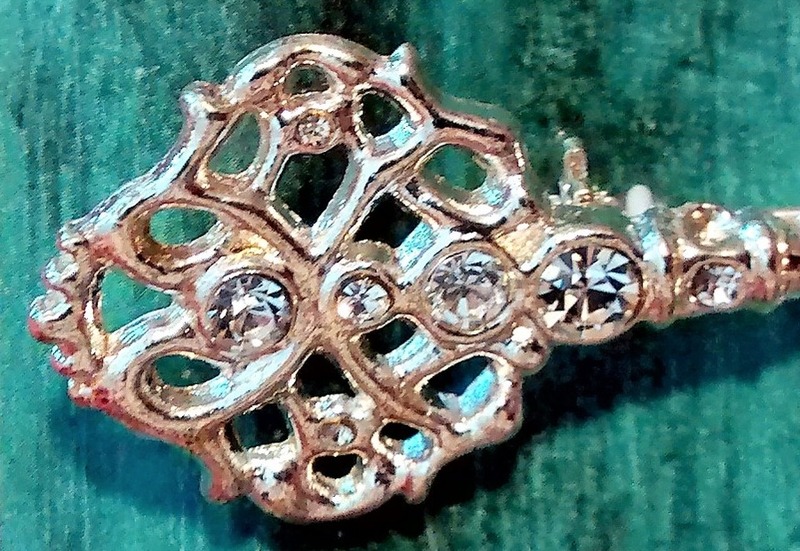 It could be used as a cute accent pin on it's own, or other embellishments can be added to it. 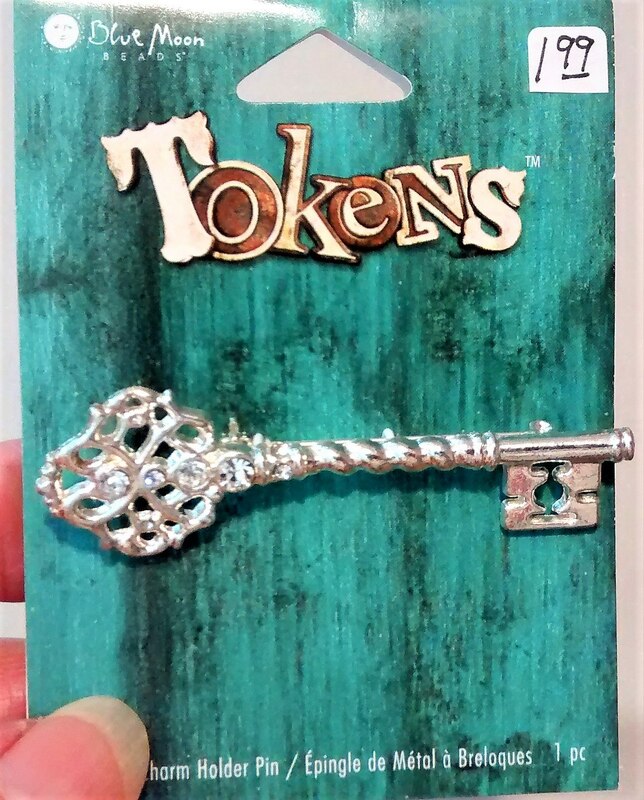 The key can also be added to other crafting projects. 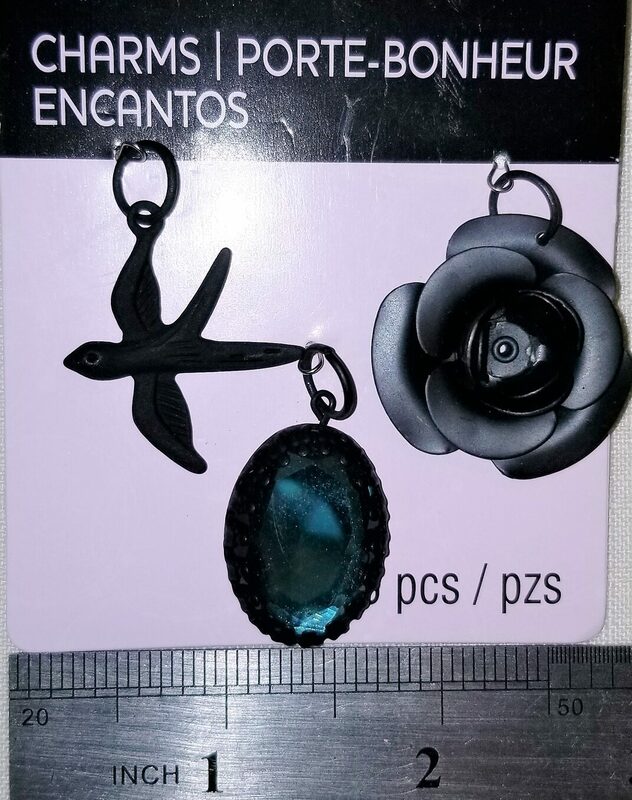 Please check with the pictures to get an idea of size and detail. 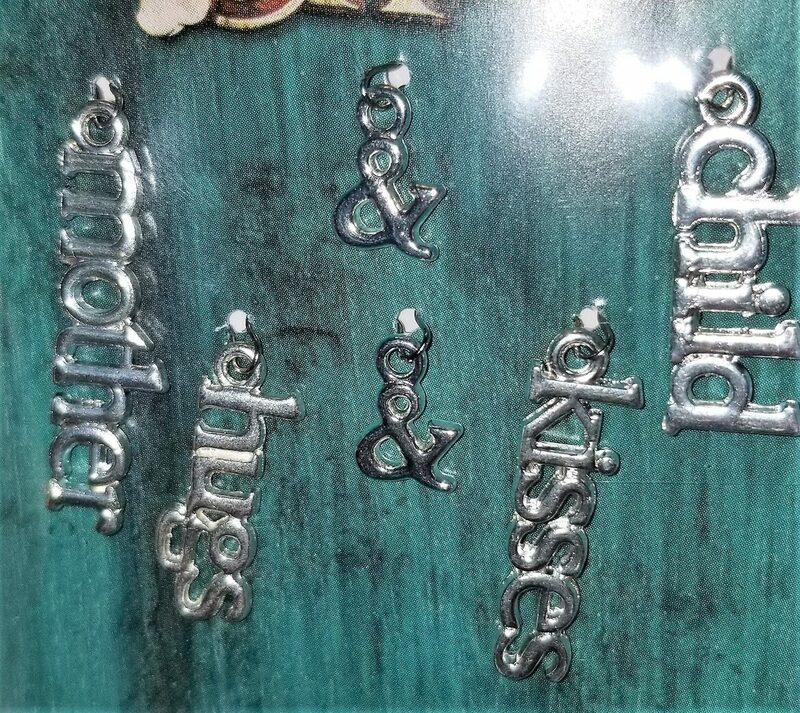 This package contains six silver finished pewter charms of the words Mother, Child, Hugs, Kisses, with two Ampersands. 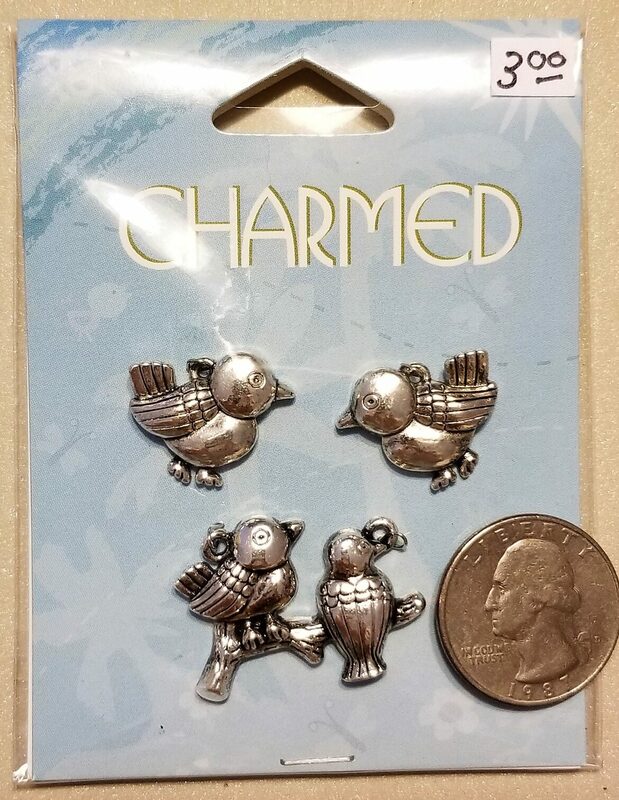 They are cute and would make a great addition to almost any craft project, or charm bracelet. 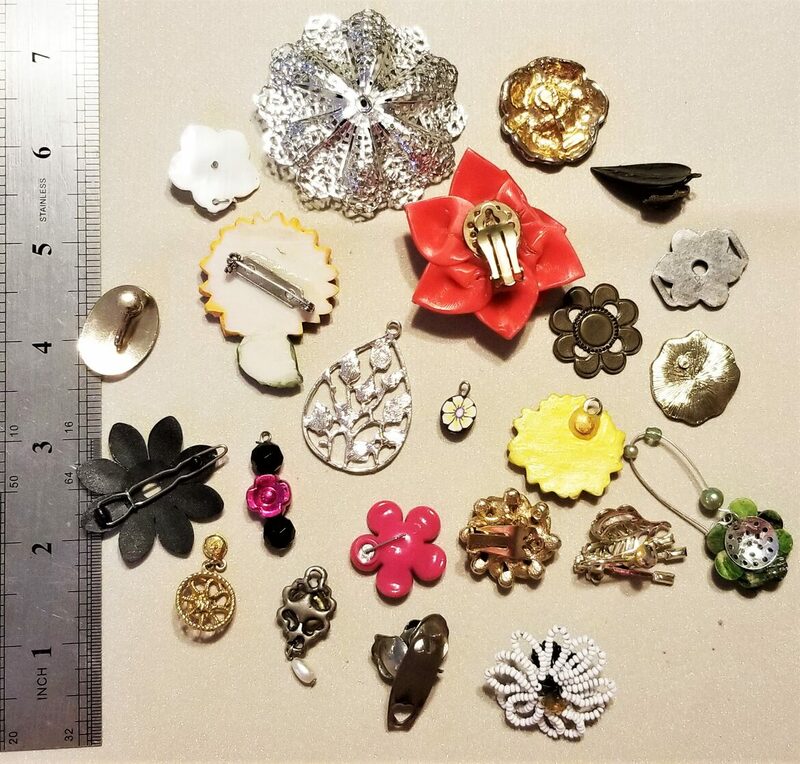 Size varies from 1 1/2" to 1 1/4" in length. 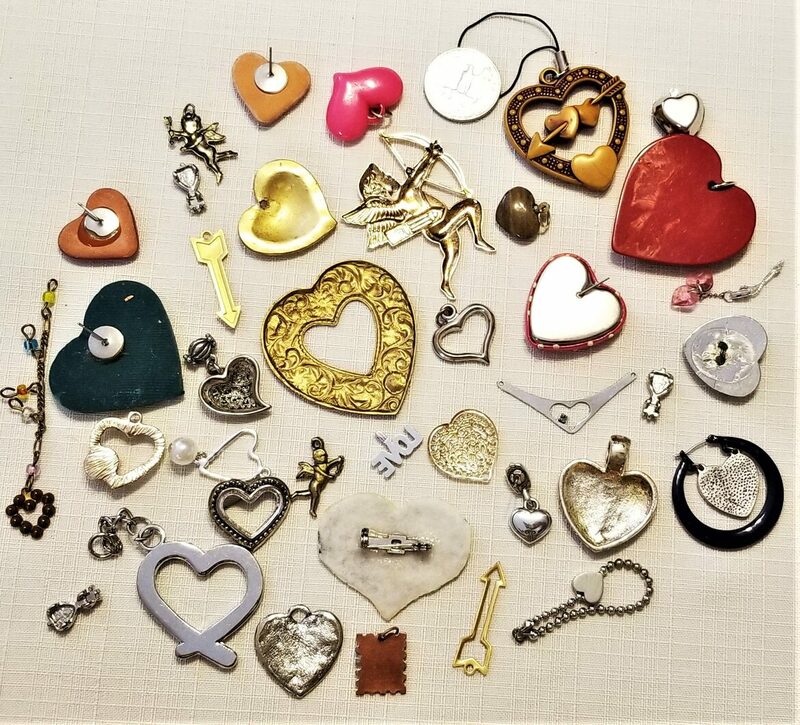 Please check with the pictures to get an idea of size and variety. 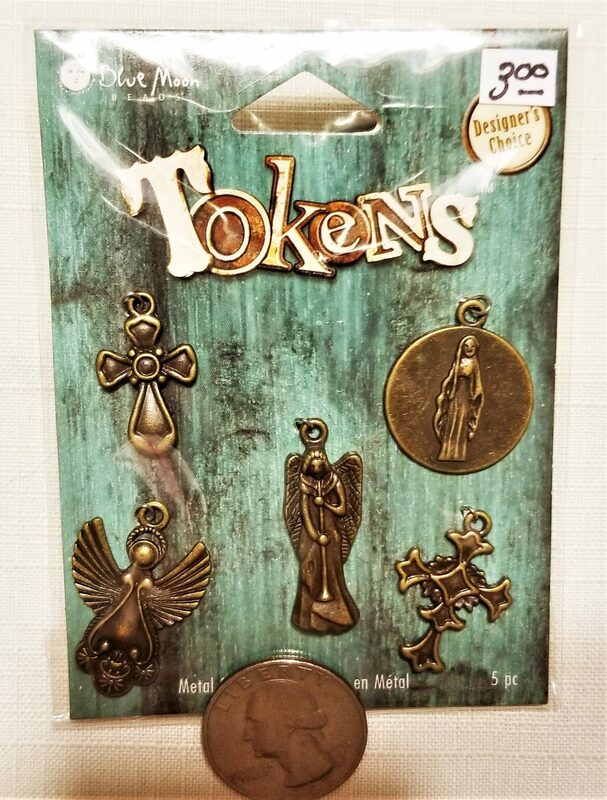 A lot of possibilities here for your crafting project. 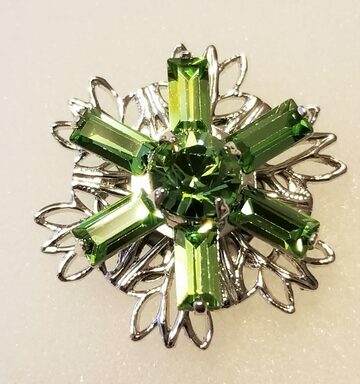 This is a 3 dimensional, silver toned flower setting with emerald green baguette Swarovski Crystals for the center pedals and one round crystal in the middle. Gorgeous. 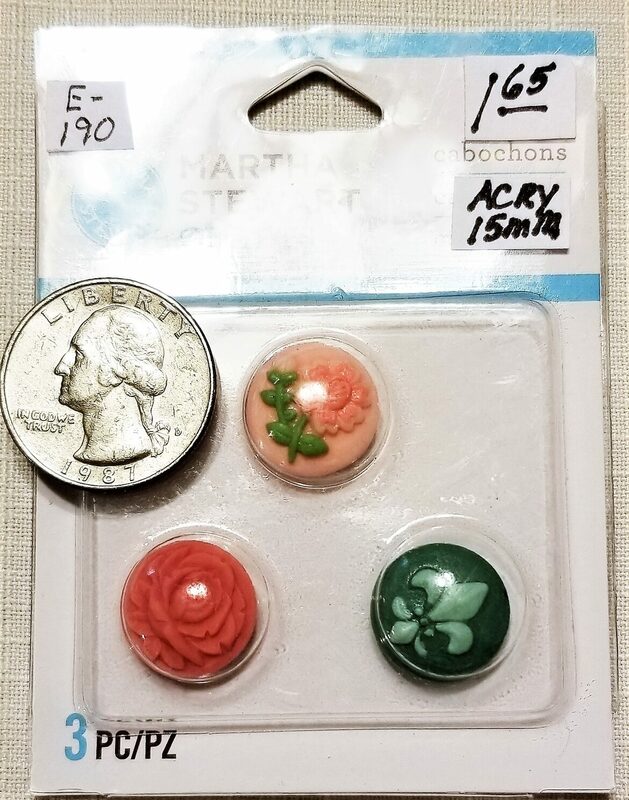 3/4 inch (17mm) in height and width. 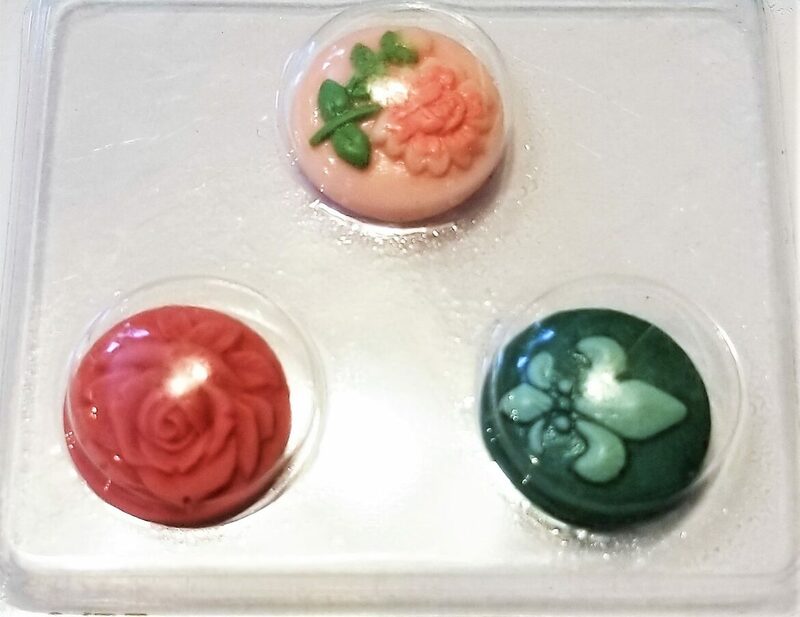 Flat cabochon like back. 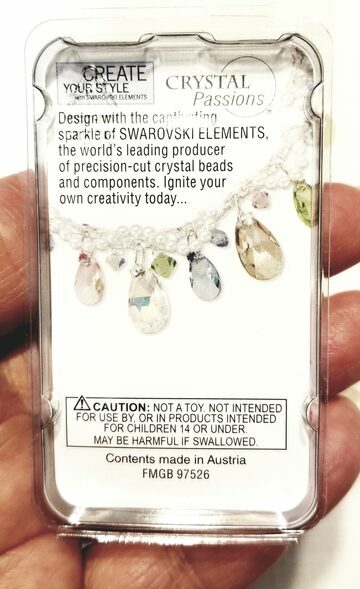 It will make a great, sparkling addition to many crafting projects. 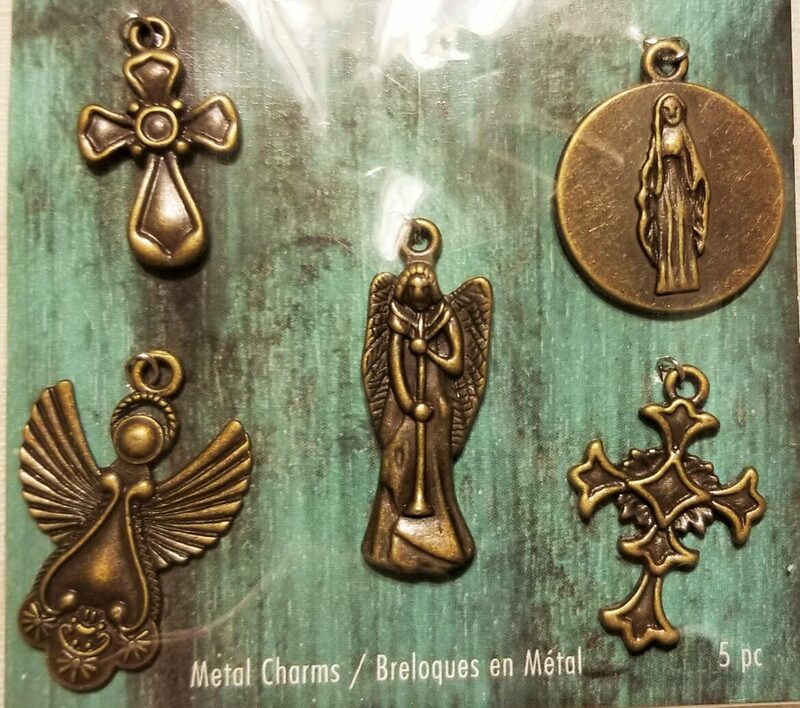 This is a set of six charms that are accented with faceted glass. These are large (e.g.) 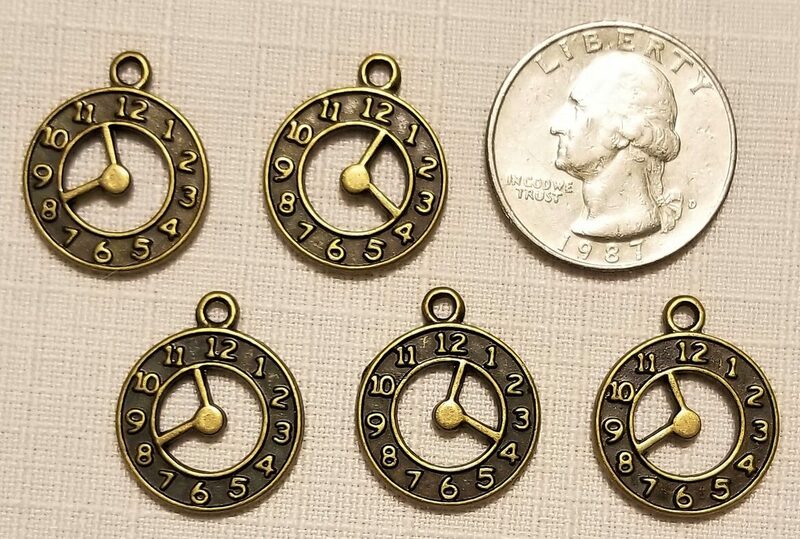 key is 2 1/4 inches in length, and all are different. They vary in size and shape. 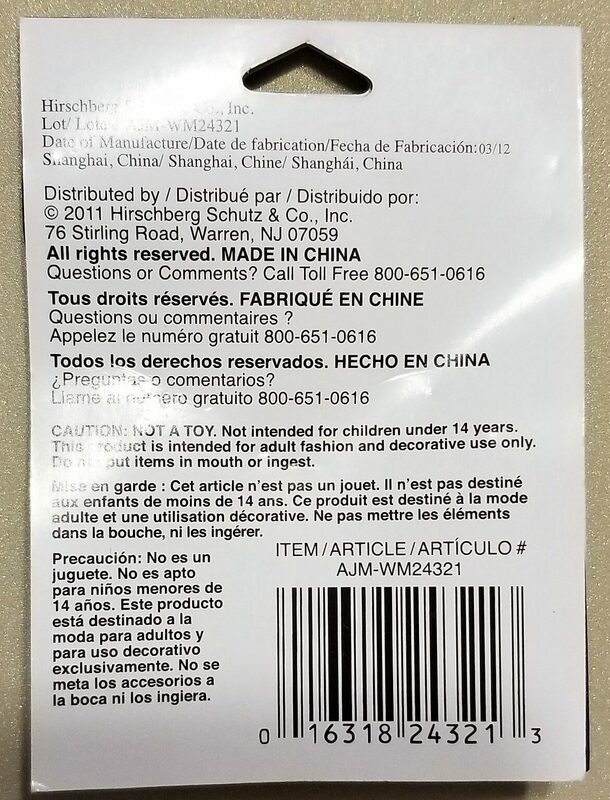 Please check pictures. Made by art-i-cake, designed by Amy Labbe. Feeling lucky? 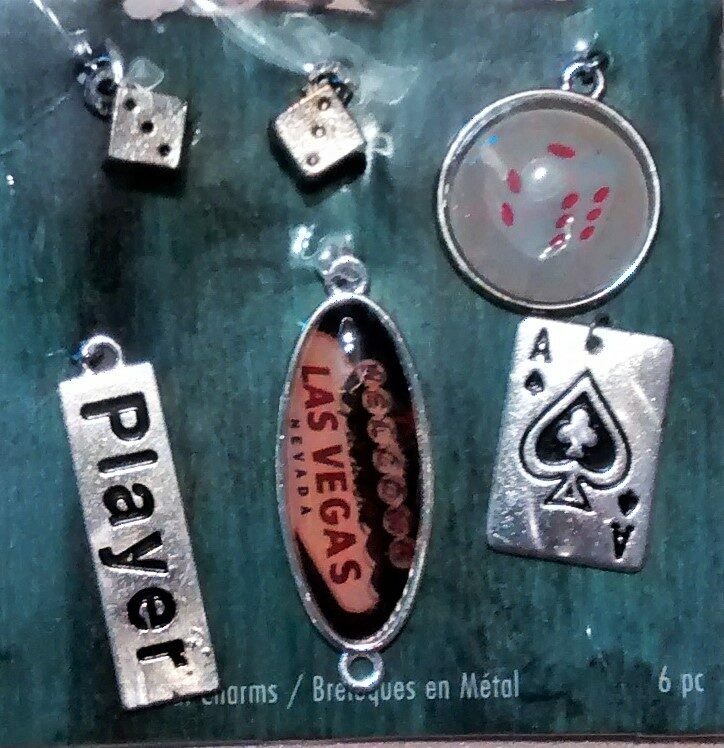 This package contains six metal charms that depict Las Vegas. 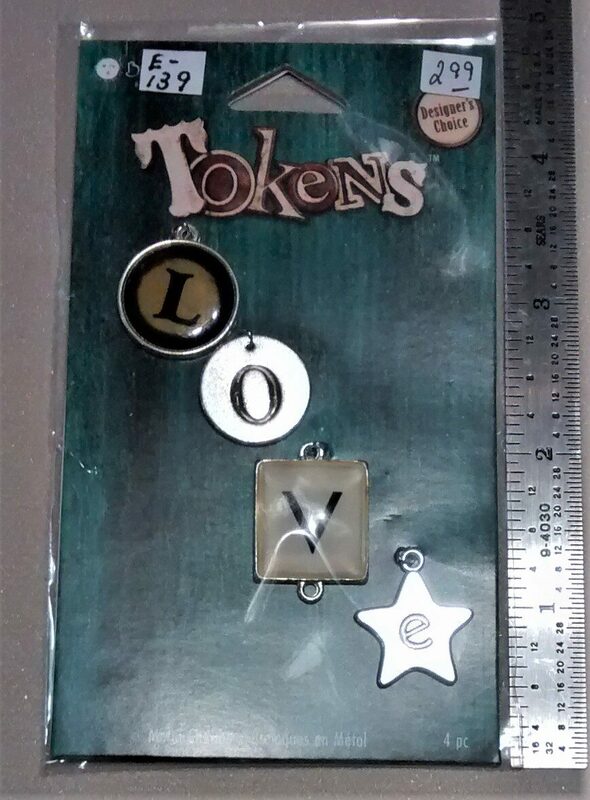 They are cute and would make a great addition to almost any craft project, or charm bracelet. 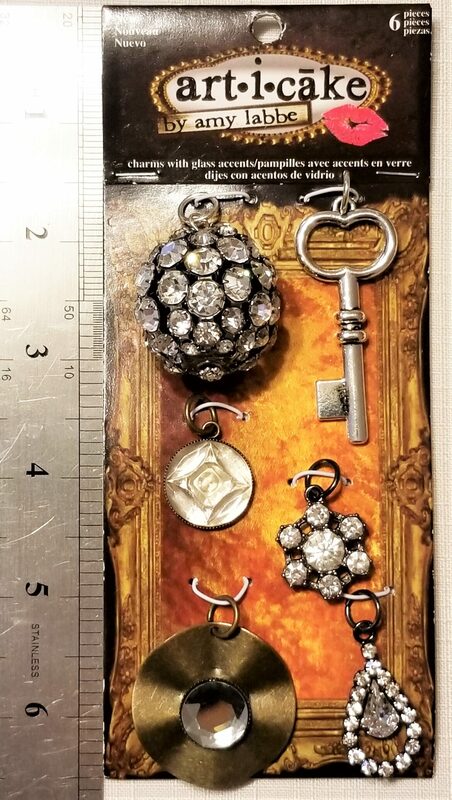 Size varies from 1/2" to 1 1/2". 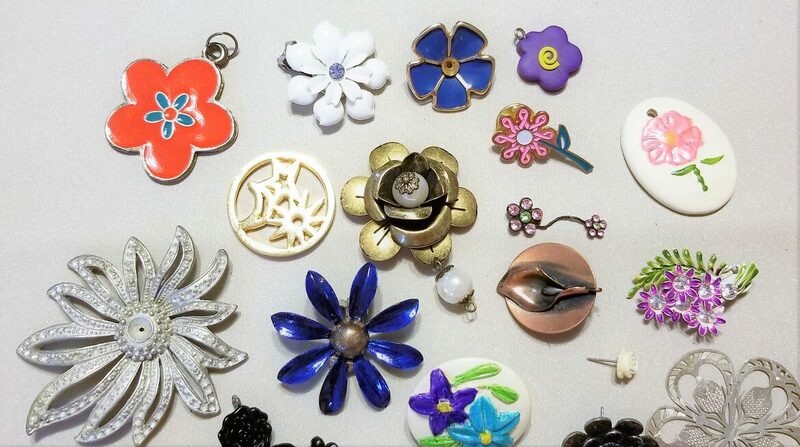 This is an eclectic mix of colorful, multi-material flowers. 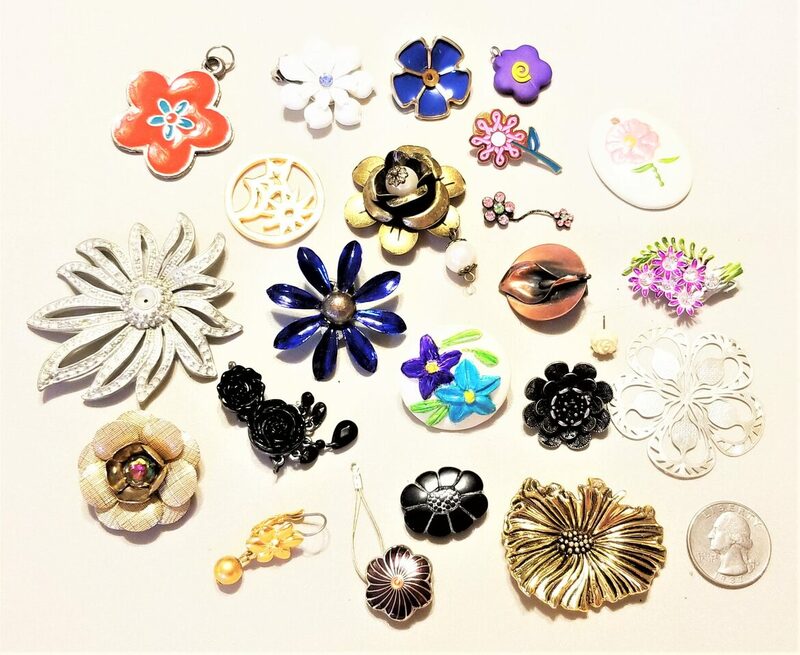 Repurposed from earrings, pins, and other jewelry. The last picture shows the backs of each of the 23 flowers. 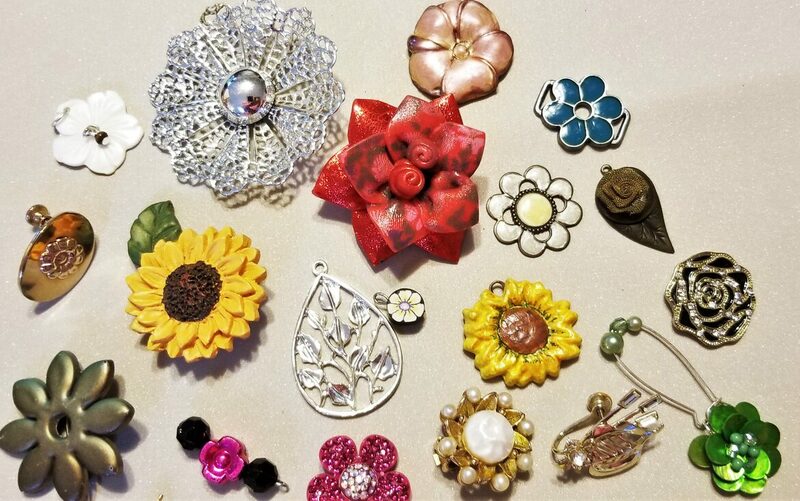 We have embellishments with crystals, faux pearls, and feature assorted styles and color. 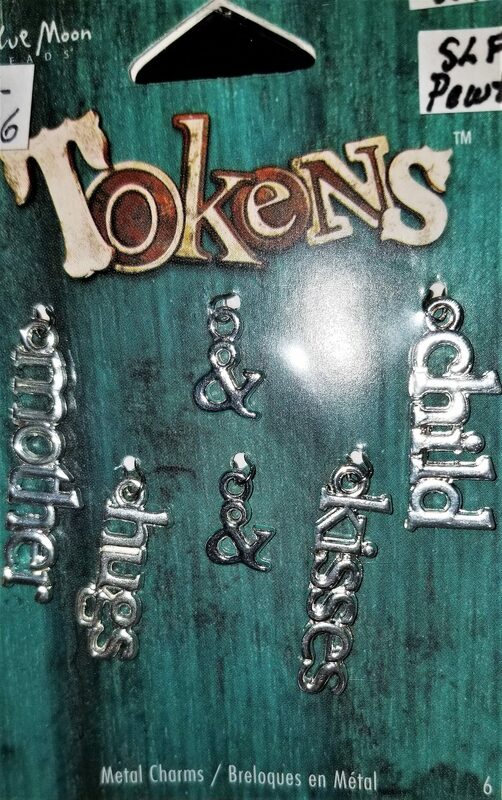 I tried to put together something fun for your crafting. 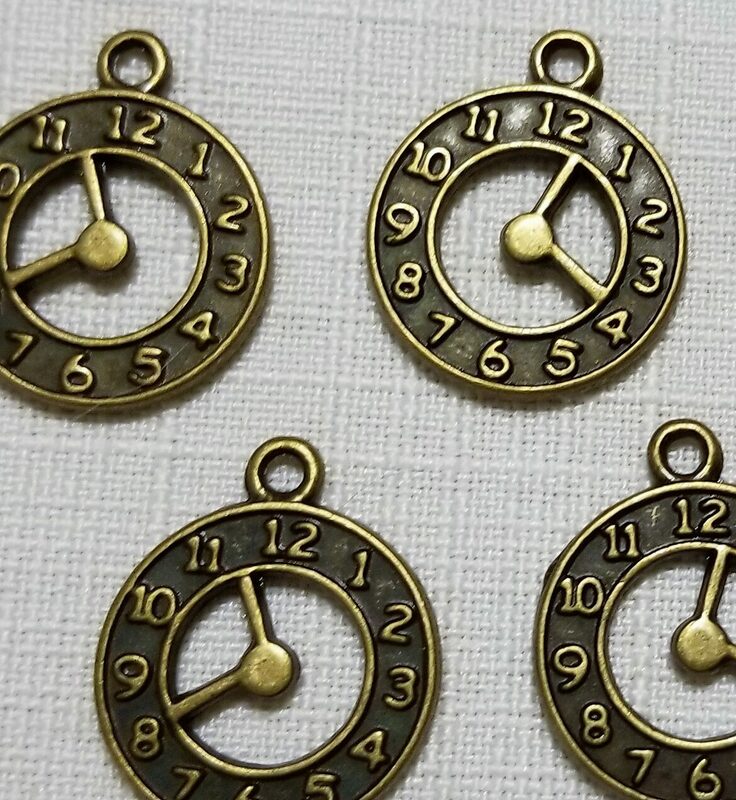 These are cute, antique brass clock faces. Five in a package. 18 mm. They have a loop on top for attaching. 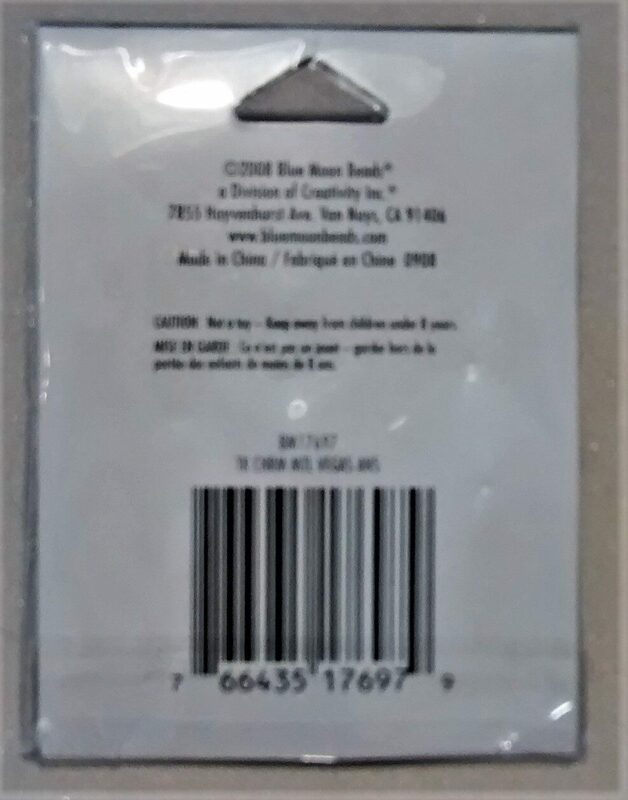 The back is identical. 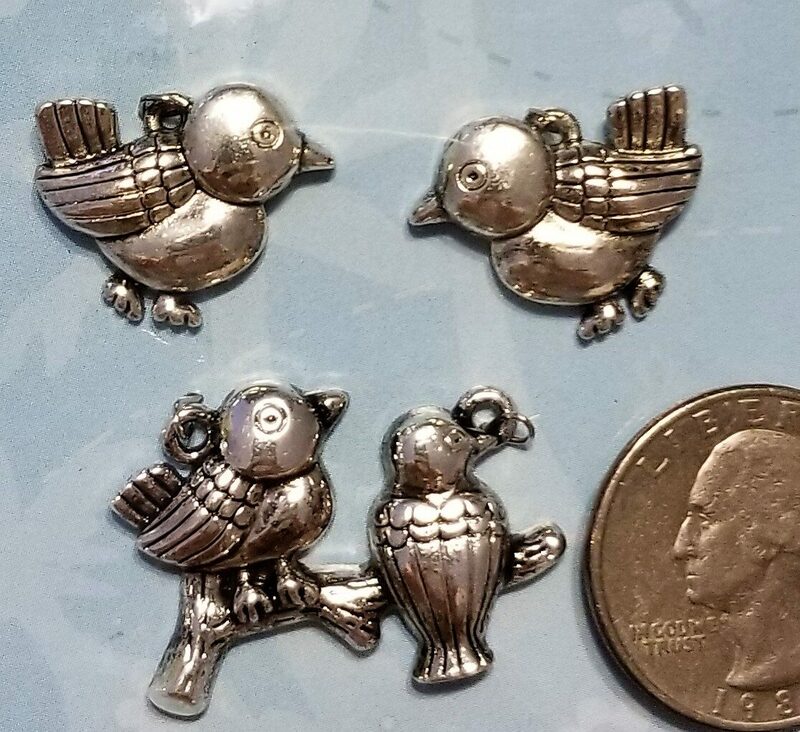 Would be a great embellishment as a charm or for Steam Punk, alternative art, and jewelry crafts would be great for these. 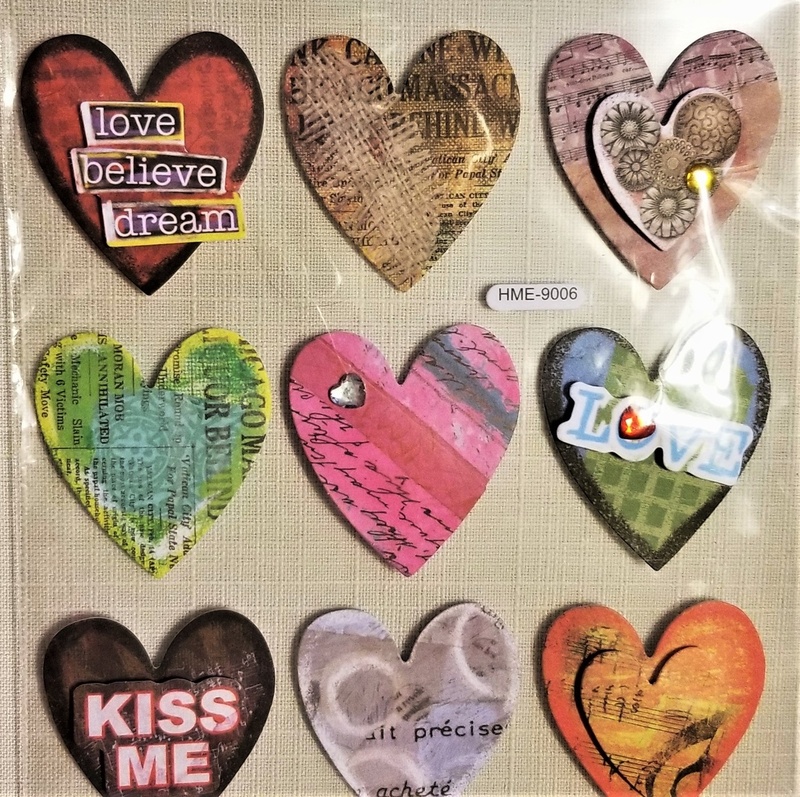 This is an eclectic mix of 35+ colorful, multi-material cupids, love, and hearts. 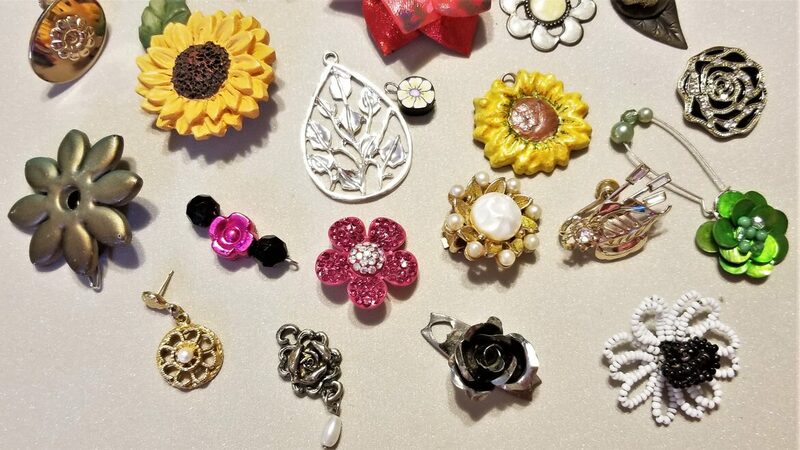 Repurposed from earrings, pins, and other jewelry. The last picture shows the backs of the elements. 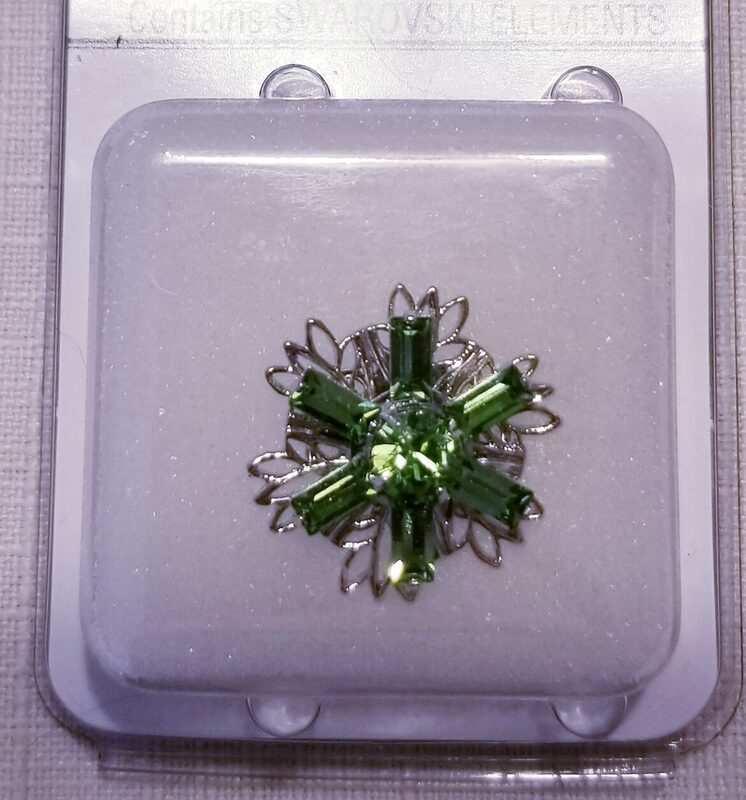 We have embellishments with crystals, beads, faceted glass, and feature assorted styles and color. I tried to put together something fun for your crafting. A lot of love here :). The last picture shows the backs of the elements. 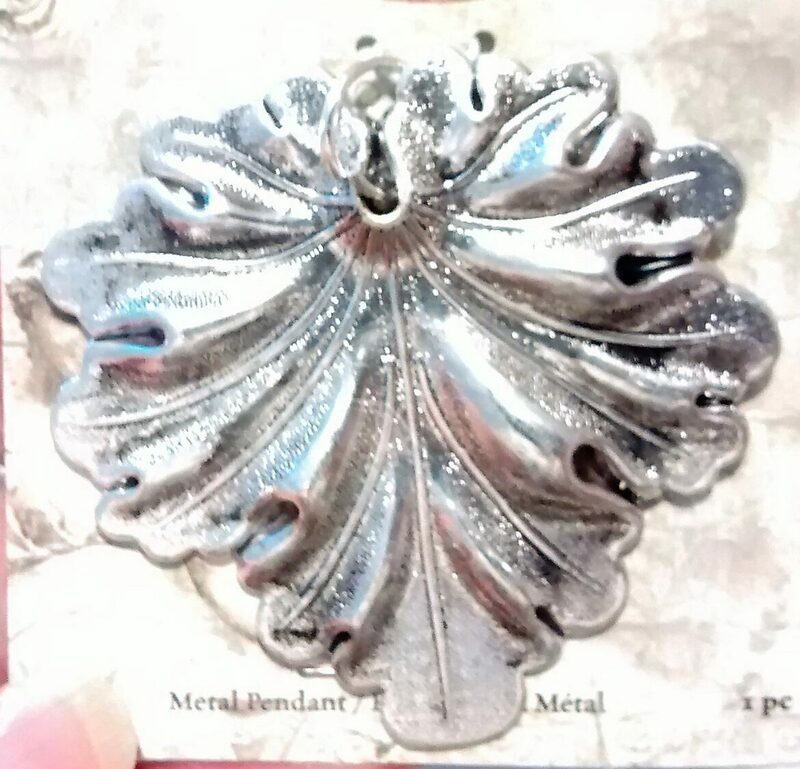 These metal pendant leaves are large 2 1/2" x 2 1/2". 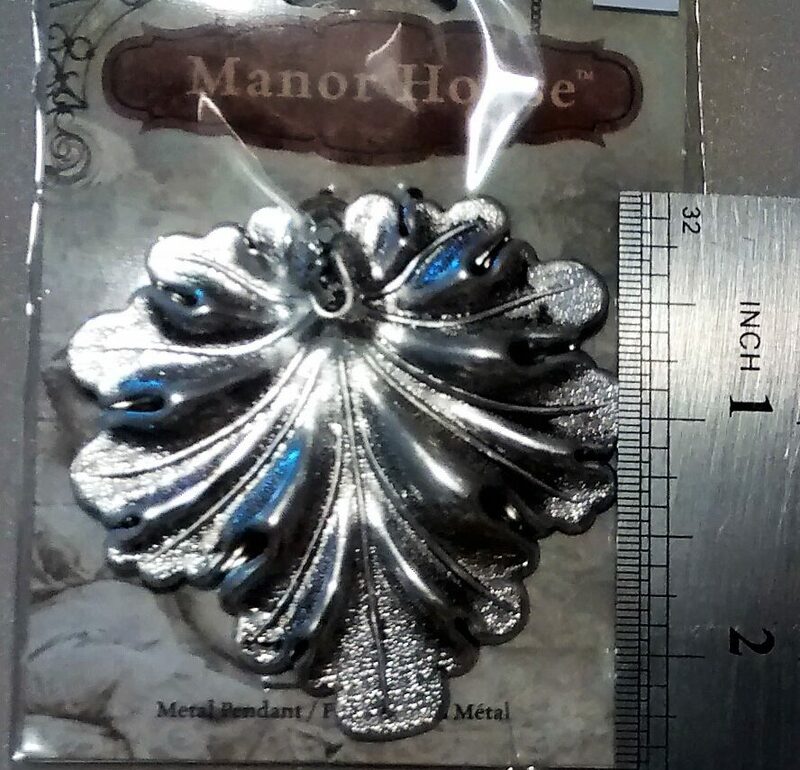 Antiqued silver and finely detailed. This leaf has a jump ring attached. These leaves will make a great embellishment in just about any craft or a nice focal in a necklace. 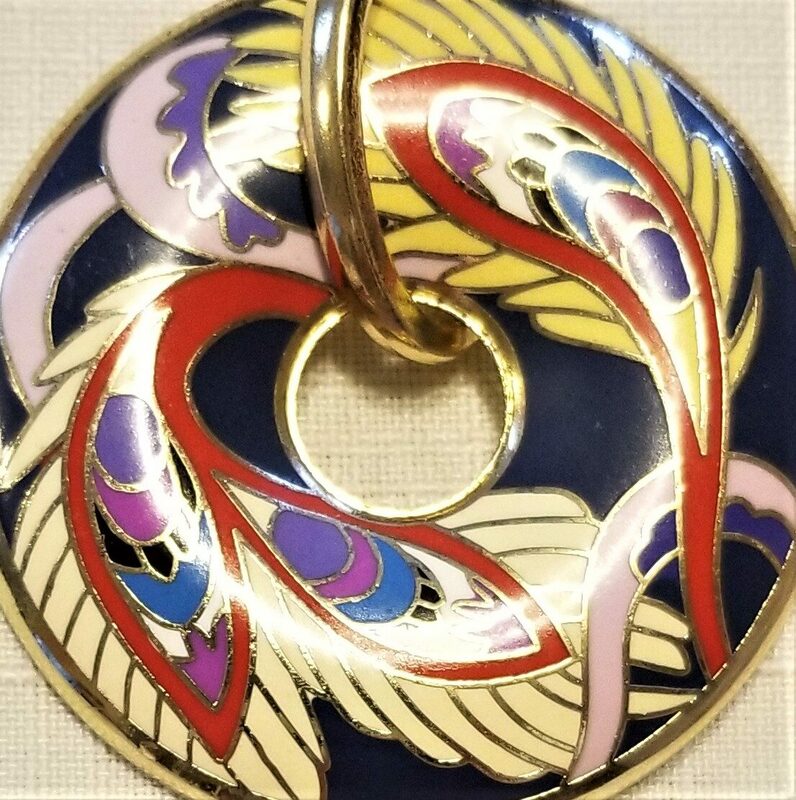 enameled design with a medium blue background and feather shapes of mainly yellow, red, pink colors. 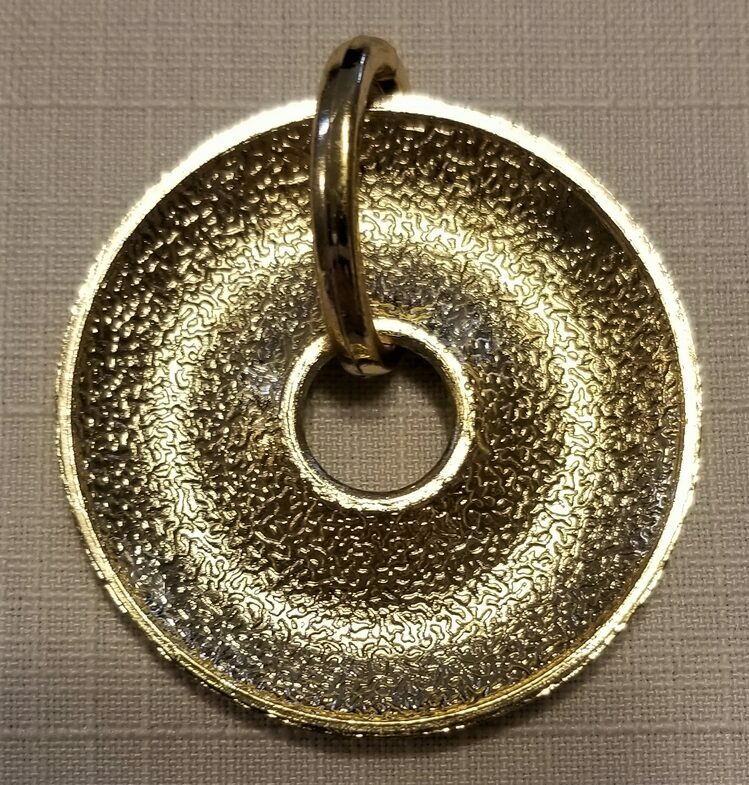 The back and jump ring is of a gold tone. So cute! 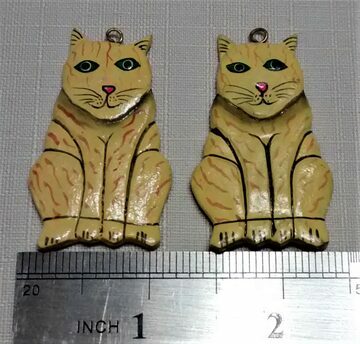 Two, wooden, hand painted, kitty cats that can be used as an embellishment or you can use them for earrings. 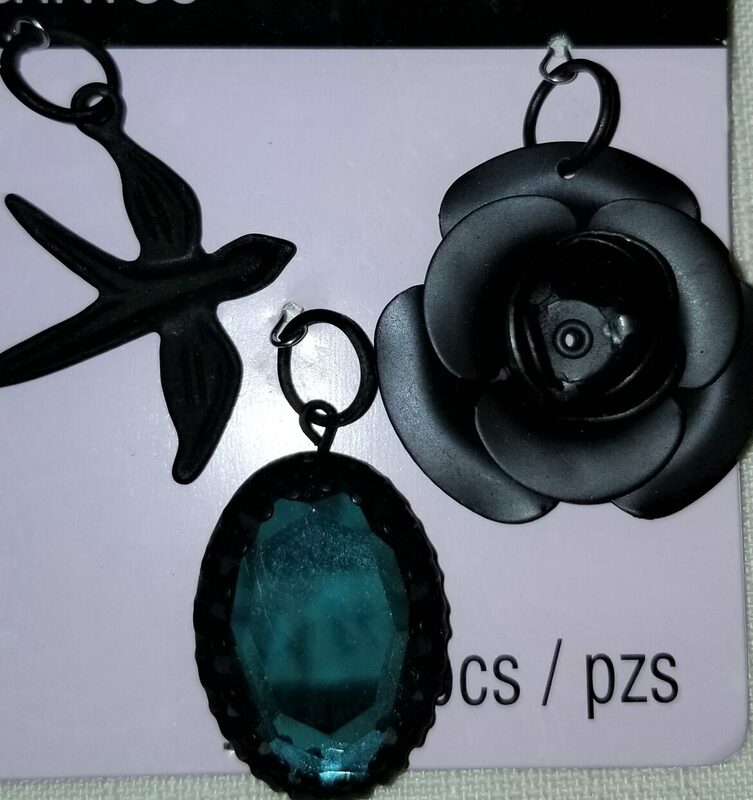 Both have a small eye pin for hanging. 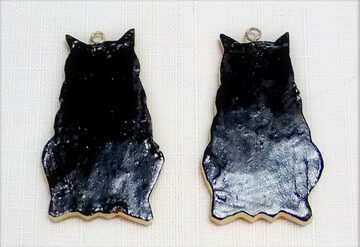 They are painted black on the back. The have a semi 3-dimensional look. 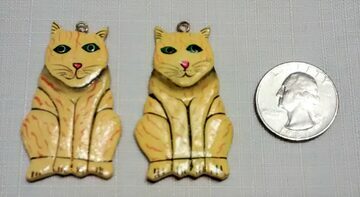 1 3/4 inches in length and 1 1/8 inches in width. 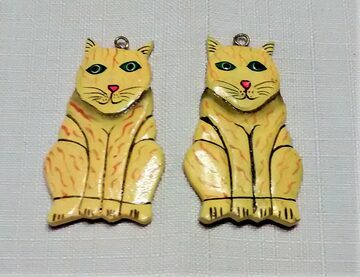 No signature on these, so I have no idea who made them or when. 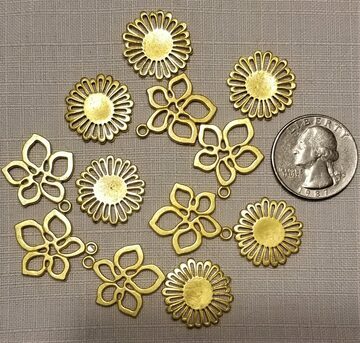 These are the cutest flowers shapes in a gold finished pewter. Approximately 3/4ths of an inch. Compare pictures for size. 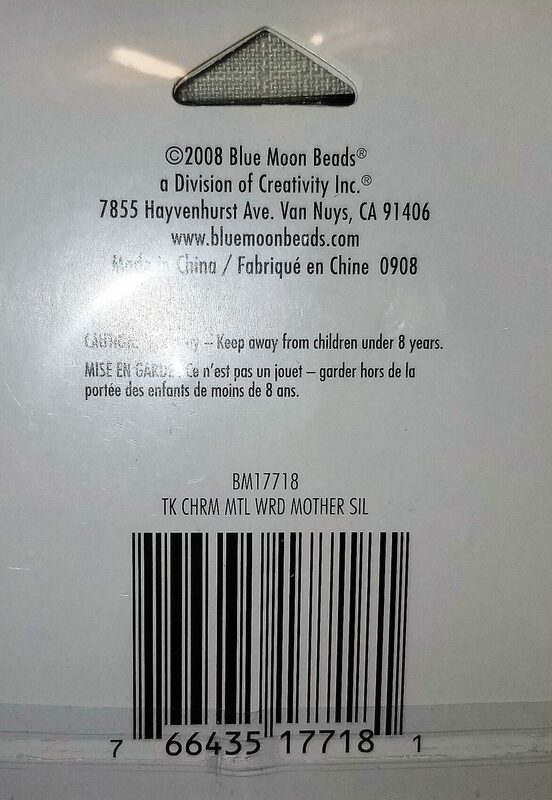 Each package contains 12 flowers. 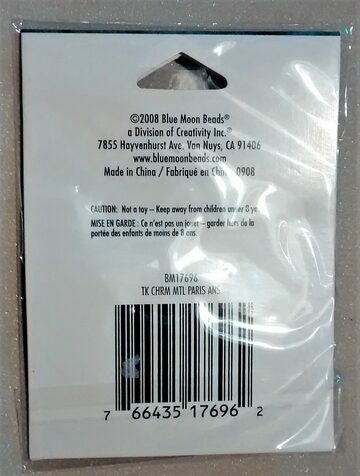 Great for many crafting projects- jewelry, scrapbooking, embellishments, etc. This is an eclectic mix of colorful, multi-material flowers. 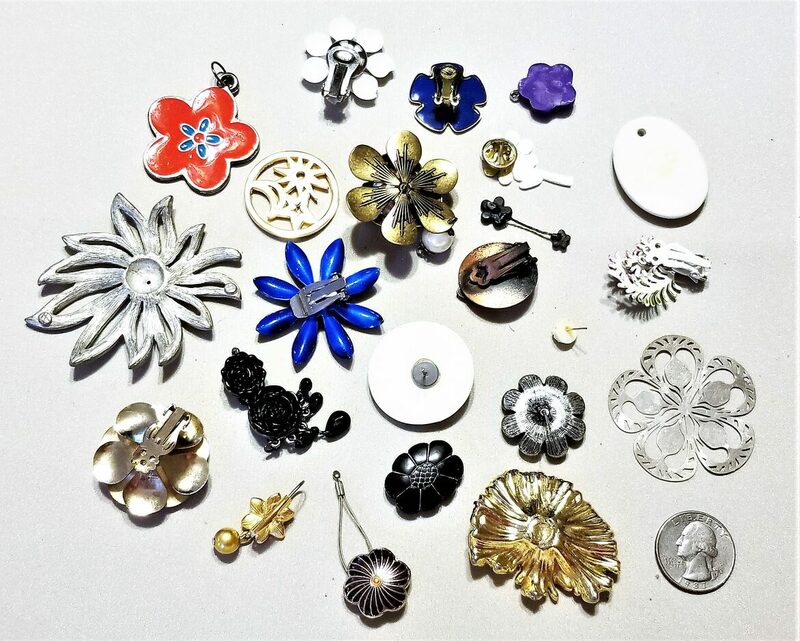 Repurposed from earrings, pins, and other jewelry. 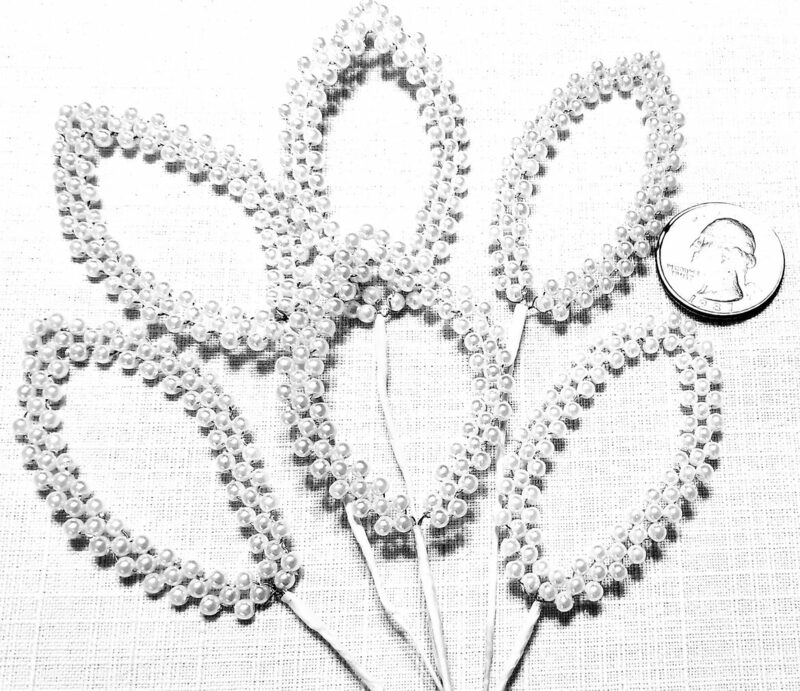 The last picture shows the backs of each of the 23 flowers. 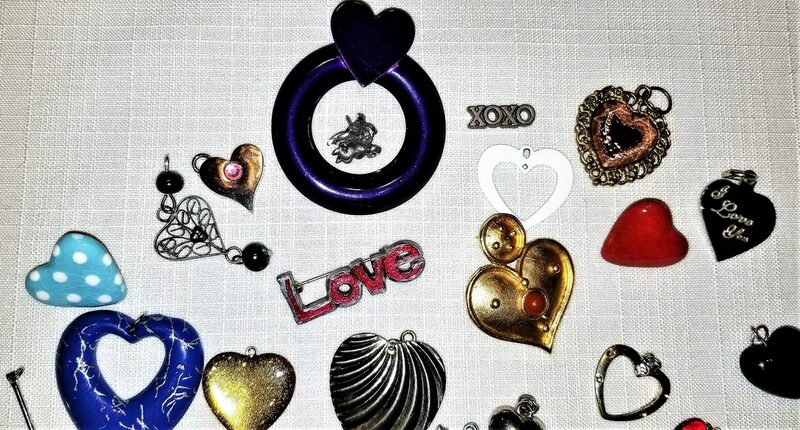 We have embellishments with copper, crystals, faux pearls, and feature assorted styles and color. I tried to put together something fun for your crafting. 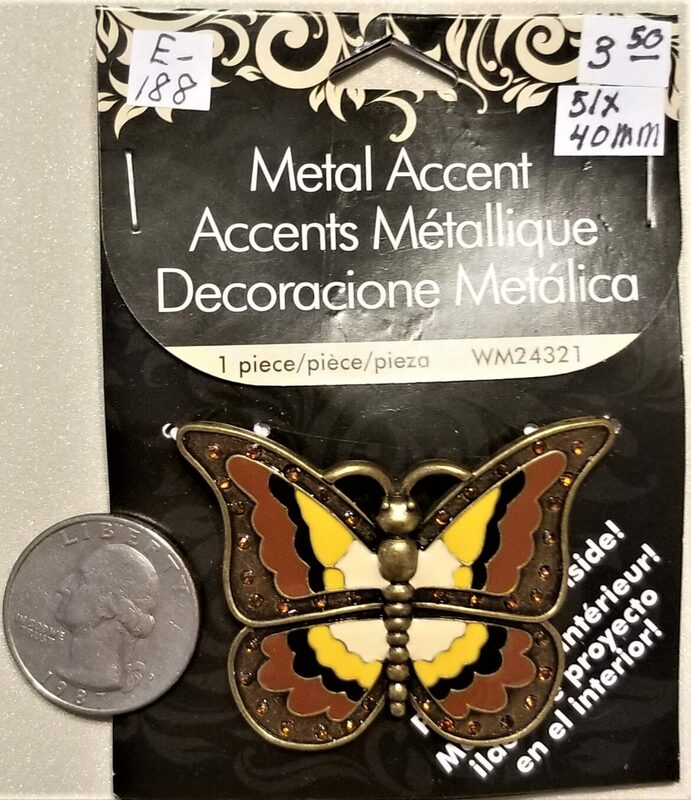 This is a beautiful antique gold, metal butterfly that has brown, black, orange and cream enamel accents surrounded by tiny brown faceted glass embellishments. 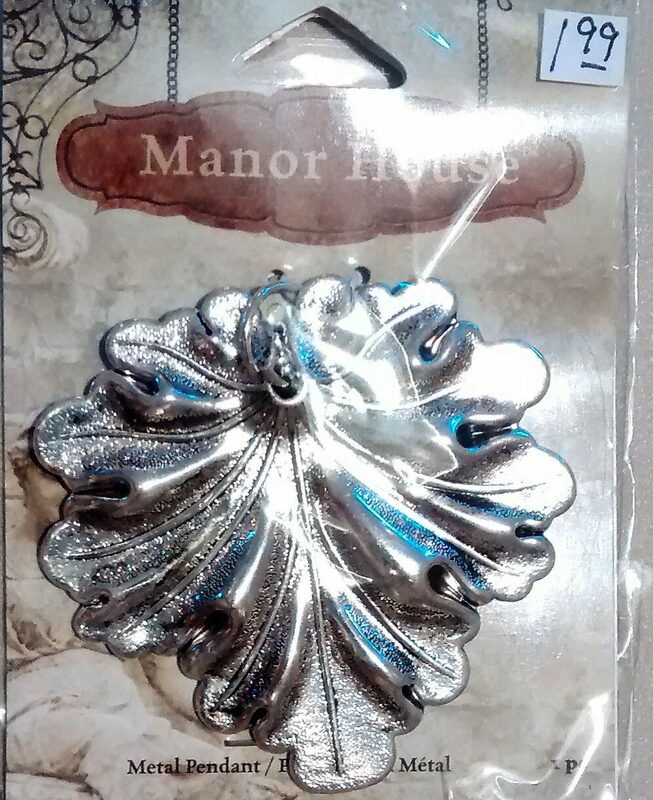 This butterfly would make a great focal piece for a necklace, or bracelet. It could also be added to a crafting project for an eye-catching accent. I am not sure what category to put these in. 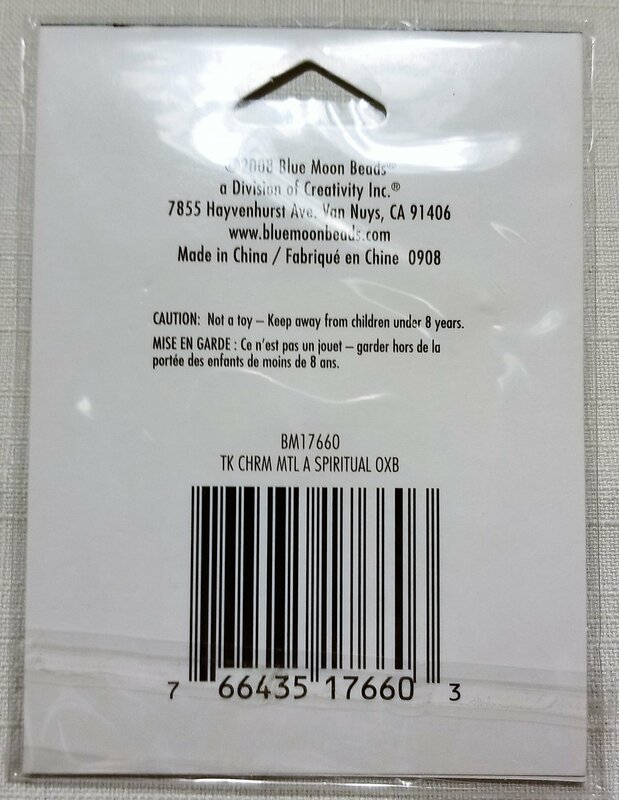 They are large, 2 1/4" in height and 1 1/2" in width, this does not include the attached wire at base. 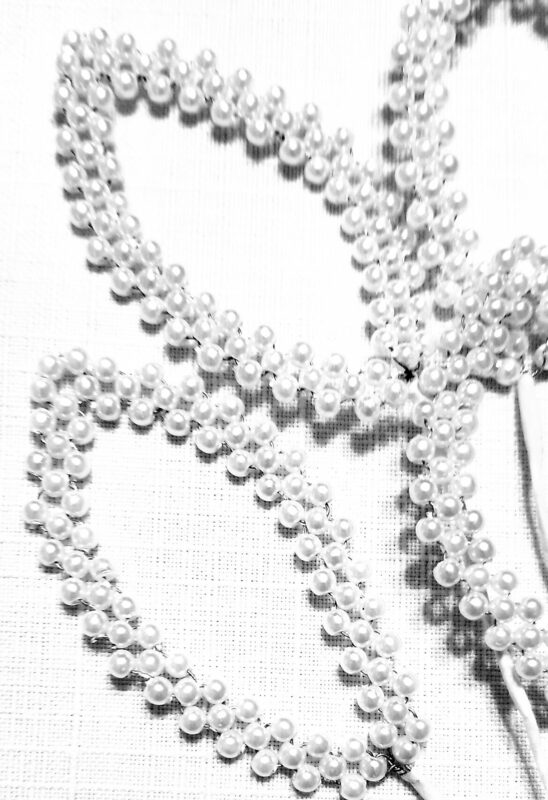 The pearl covered oval or leaf shape is gorgeous. 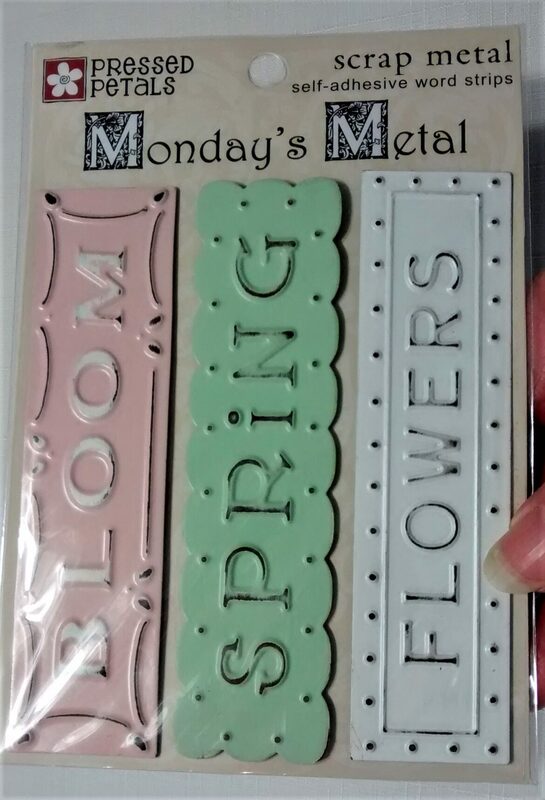 I can see these in all kinds of crafts. Hats, jewelry, anywhere. 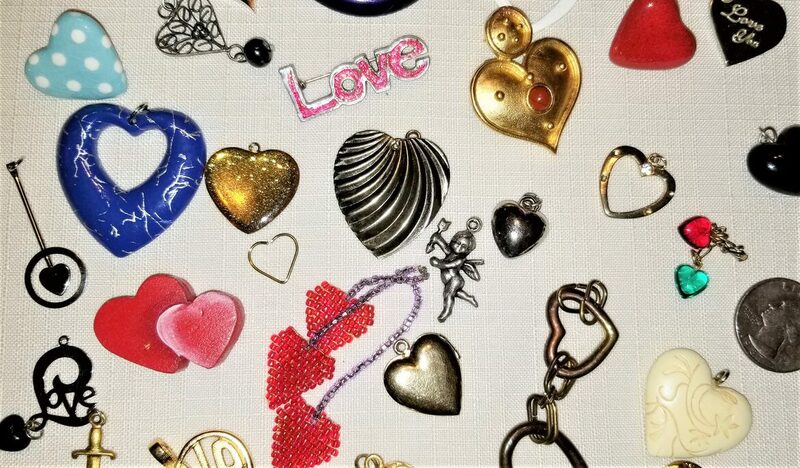 There are four charms that spell out L-O-V-E in various shapes. 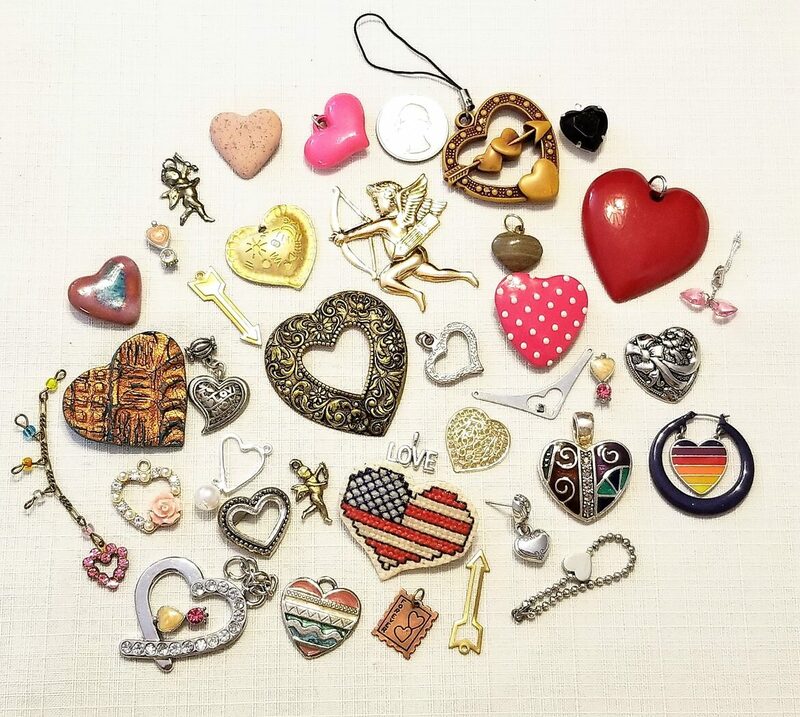 These would make a cute charm bracelet, or accents on other crafting projects. They are approx. 1" in height. 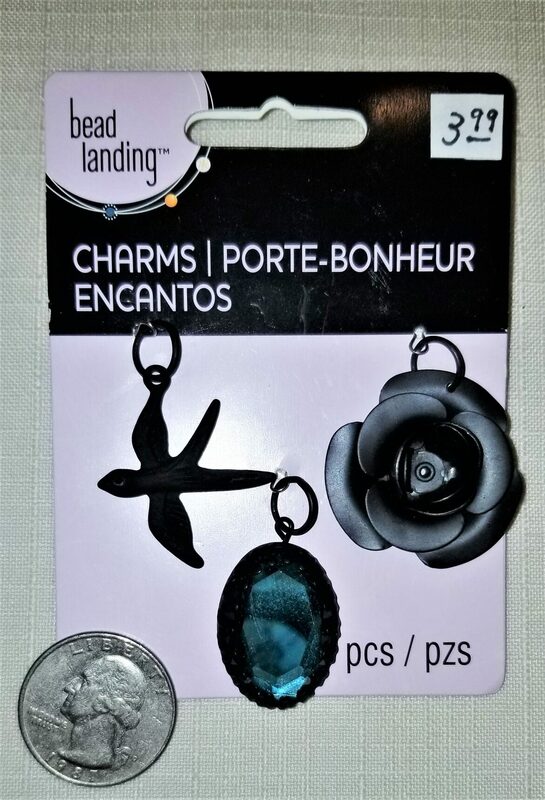 Three, sweet charms, flat black rose, flat back bird, and a teal blue colored faceted oval glass set in a black frame. 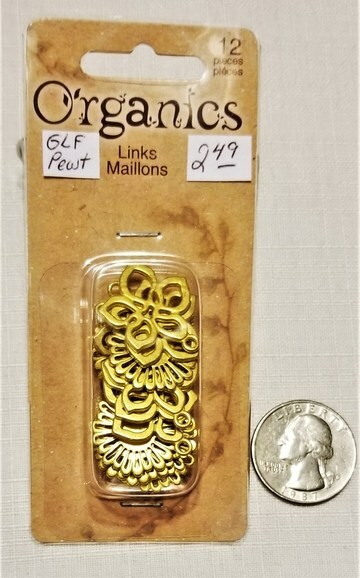 These are a nice size to use in necklaces, bracelets, or other jewelry creations. 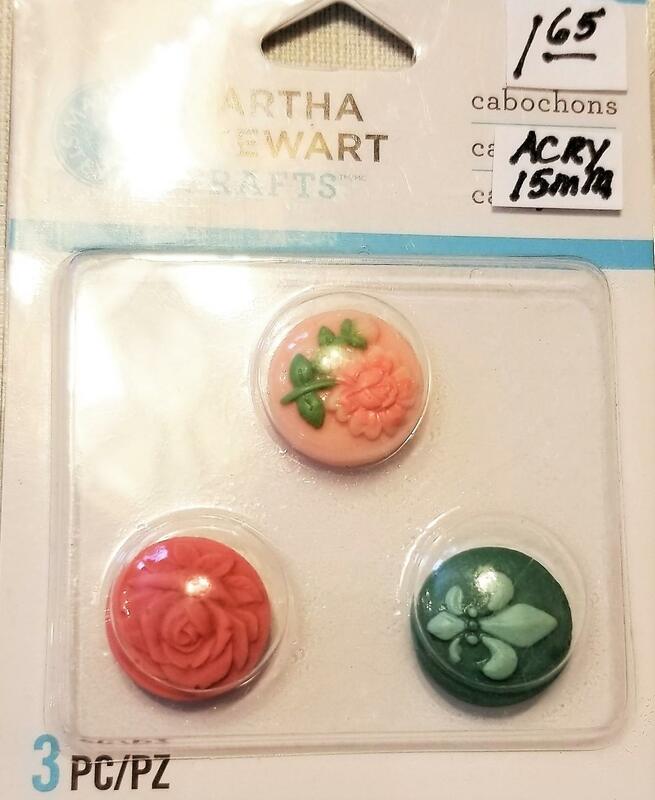 Great for many crafting projects. 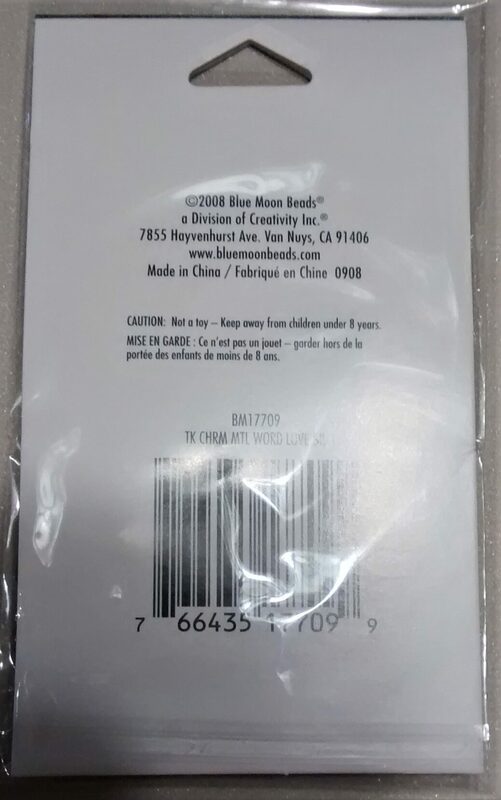 Please check pictures to get an idea of size and shape. 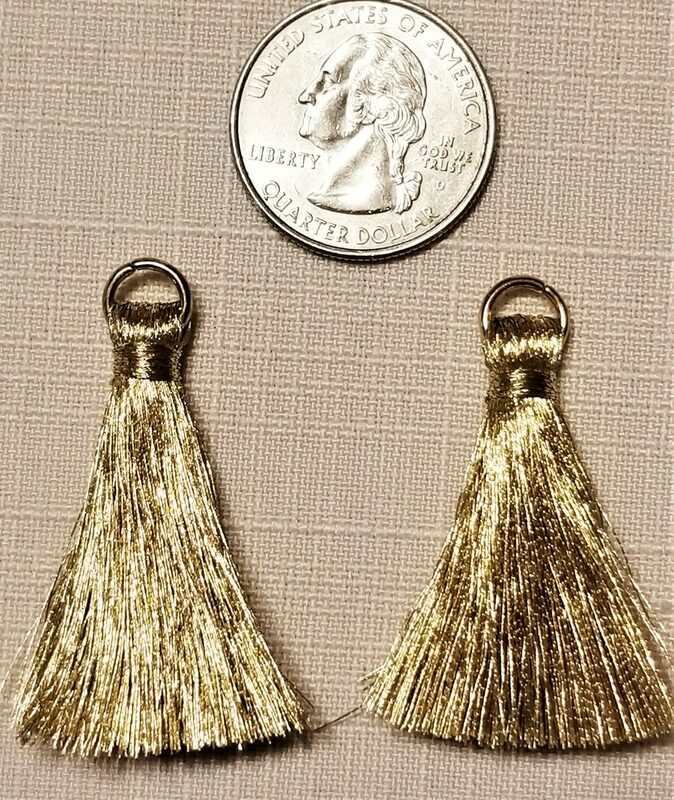 Sweet, petite, tassels of gold metallic thread. crafting. 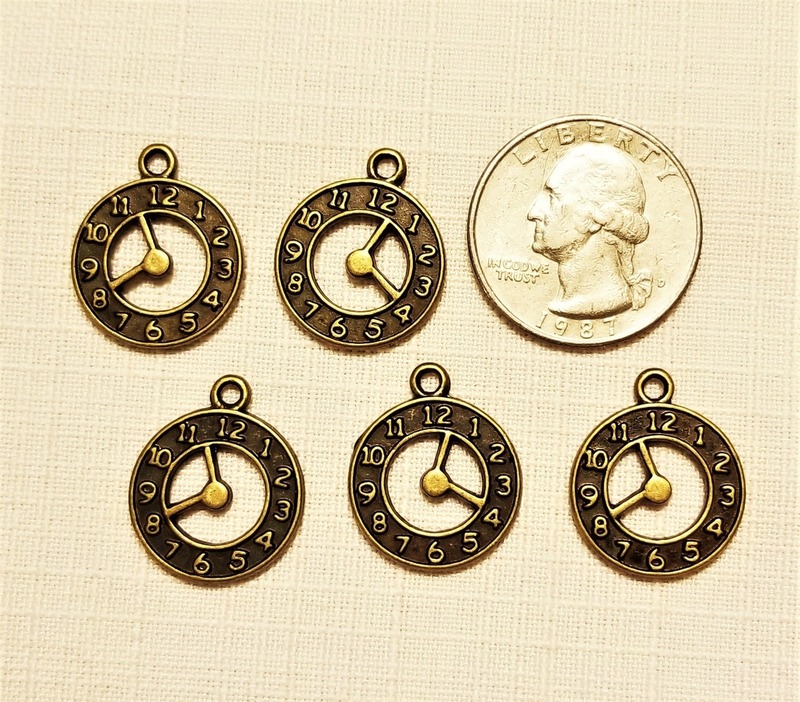 Each has a gold jump ring for attaching. Approximately 1 1/2 inches in length.